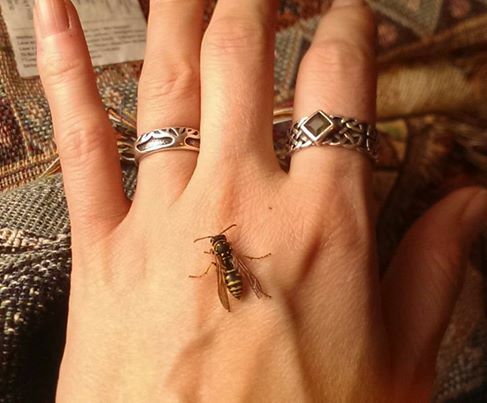 This beautiful, european paper wasp queen had chosen an amazing spot to overwinter…inside my bird feeder. While it was safe when she chose the spot, it was soon to be filled in and unfit habitat for anything living, never mind royalty! I was able to make her a new home to overwinter, while she warmed up a bit inside. I didn’t want to upset her pattern too much, so it was a quick visit; however, I enjoyed my time with the queen immensely! Queen paper wasp queens are selected for due to their egg laying abilities and their face patterns. The more large and scattered the black spots on her face, the more likely she is to be the dominant female foundress, the queen. If the dominant queen is lost to a colony, the second most dominant queen will assume the role and responsibility. Unlike honey bees, who may have the same queen for up to five years, paper wasp queens only last a season. So this visiting queen, is a potential new queen, to be tested in the spring. She will spend the winter alone and try to start a whole colony in the spring, first by creating enough cells to raise a few females to help expand the colony. She will overwinter in leaf litter or beneath bark, somewhere protected. With such a daunting task ahead of her, I am sure the weak potential queens are weeded out fairly consistently. Not only does she need to survive through the long, cold winter alone, but then build a whole colony. I wish her lots of rest this winter!